Build your first Robot in one day. Now make it dance! The Robot Kit for Arduino includes the products listed below. 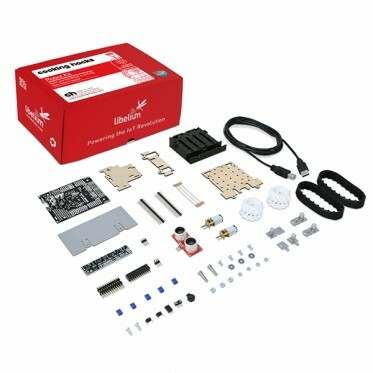 The Robot Kit includes everything necessary to assemble and program a small tracked robot. Less than 10 cm × 10 cm, it is small enough to qualify for Mini Sumo. It has two micro metal gearmotors coupled to a pair of silicone tracks, a stainless steel blade, a buzzer, six infrared reflectance sensors for line following or edge detection, magnetometer, a triple axis accelerometer and a gyro for detecting impacts and tracking orientation. You will need an Arduino and 4 AA batteries and it's ready to go!